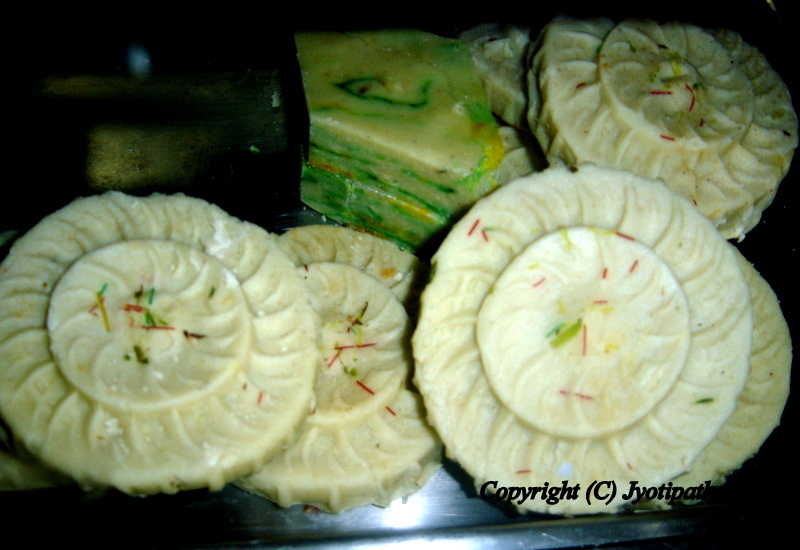 The traditional sweets of Nepal are called "Mithai" or "Guleo Khaanaa" in Nepali. Nepali sweets are served throughout the day: with breakfast, with afternoon tea as a snack, and after dinner. The confections are made from a wide variety of ingredients, including milk, fruits, vegetables, flours, grains and beans, nuts and seeds. Some Nepalese sweets are quite sweet and often paired with plain foods such as yogurt, poori bread, swari and fruits. The sweets are flavored with green and black cardamom seeds, saffron, and certain essence. 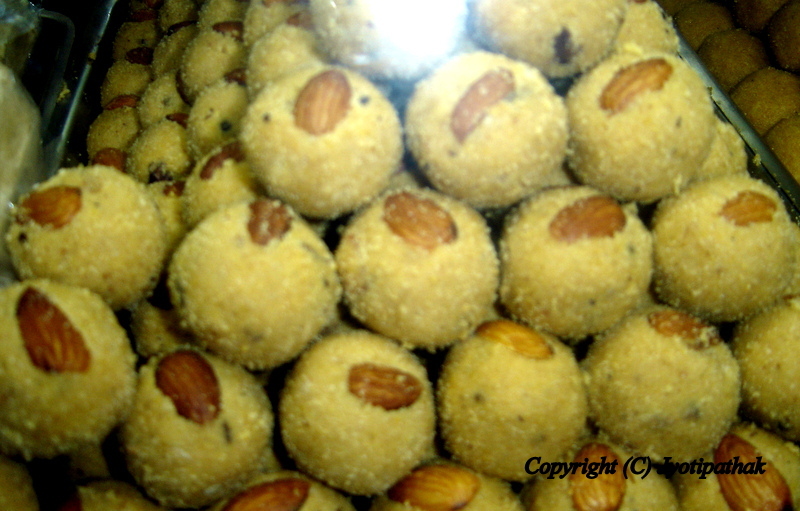 They are decorated with finely chopped cashews, almonds, coconut, pistachios, silver leaf, and many other kind of nuts. Sweets are usually purchased, but some are prepared at home with using a timeless old fashioned method, specially for religious occasions. 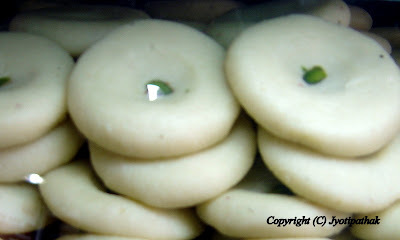 Here is a virtual tour (pictorial tour) of traditional Nepali sweets. I have uploaded several traditional sweets captured at different locations of Haluwai Pasal (local professional sweet maker's shops) in Nepal. Some of the sweets come from my own home-made version, from friends' kitchens, as well as other imported sweets (mainly Nepali version of Indian Mithai) available at local shops. I have added a brief description and Nepali names of the sweets wherever possible. 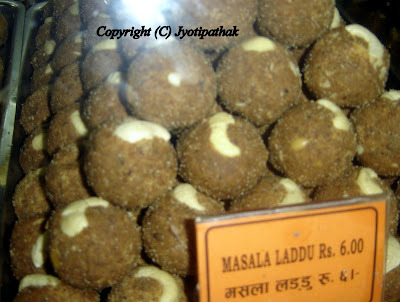 I will be dividing the blog of "Traditional Sweets of Nepal" into several different sections. Please check it out all. I hope you will have much fun as I am have had putting together the virtual tour of Nepali sweets. Please drop me a few lines in the comments section of the blog. Your comments and feedback are important and I would love to hear from you. Jeri, also known as jalebi or jilphi, are one of the most common sweets in Nepal. They are deep-fried, pretzel-shaped yellow-orange loops dipped in saffron syrup. 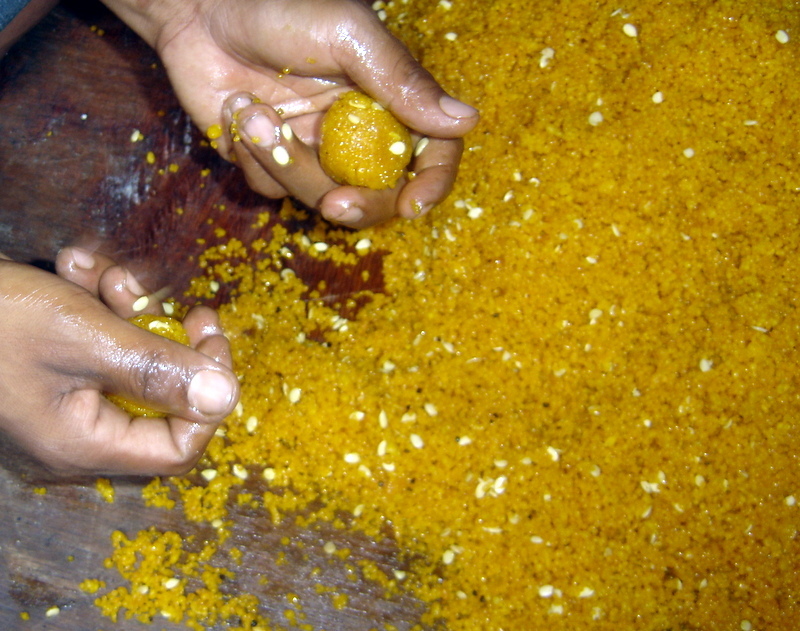 Jeri tastes best when freshly made as they are crisp and the filling is succulent and aromatic. The next day, jeri looses their crispiness, and the filling crystallizes, but they are still delicious. Traditionally, jeri are paired with soft Nepali bread called swaari. Anarsaa - अनर्सा - (Poppy Seed & Rice Flour Patties) Anarsaa-roti are old fashioned sweet rice patties (resembling large cookies). Rice flour gives this bread a crisp texture, and poppy seeds provide a pleasant nutty flavor. The dough is hand stretched into circles and deep fried. The traditional sweet is freshly fried until lightly browned and stacked up neatly. It is kept this way until all the extra clarified butter is drained from the patties, before moving into a decorative platter. Anarsaa is eaten during festivals, family celebrations, and simply as a mid-afternoon snacks. Divinely delicious creamy white Paneer Peda - पनीर पेडा - freshly made from soft Paneer cheese dough, sugar, green cardamom, and decorated with sliced pistachios. 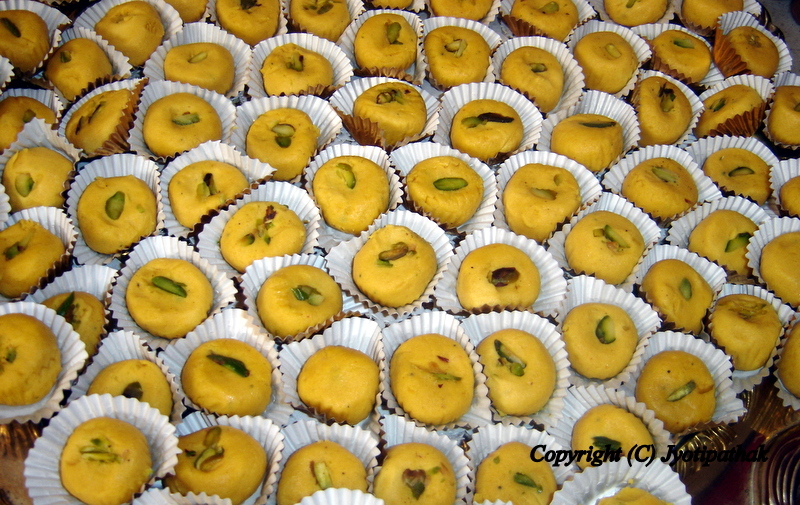 Another picture of decorative, semi-soft Peda patties, same ingredients as regular khuwa Peda (thickened milk, sugar, flavorings), but molded into beauty with fine details and decorated with saffron and chopped pistachio nuts served at many special occasions. Pure Kaaju Peda - काजु पेडा - a decorative, rich and delicious variation of Peda made with ground cashew nuts, thickened milk, sugar and studded with finely sliced pistachio and crushed green cardamom. 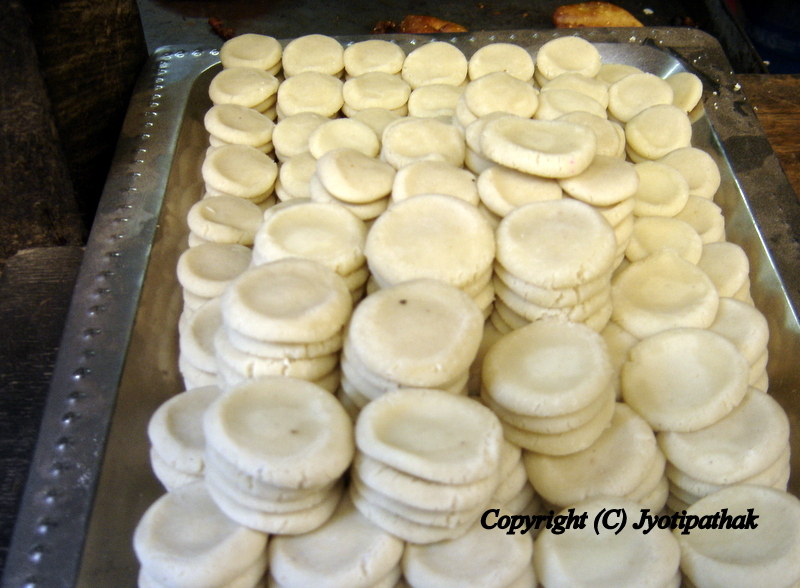 Peda, a small, round patties prepared from thickened milk, is a popular Nepali sweet. Traditionally, they are made from Khuwaa, which is a slowly simmered-thickened milk. Sweet Malai Peda मलाई पेडा- these smooth and silky textured peda are made from thickened milk, sugar and pistachios nut and they are pressed into Round ring mold to create decorative shapes. The freshly made Prashad ko Peda प्रशाद को पेडा (made for religious offering) is getting ready to be decorated. 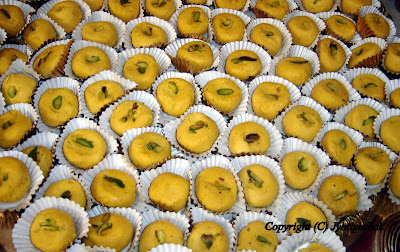 A chopped pistachios nuts or sometimes a whole nut is pressed into the center of peda to decorate them. Closed-up look of the Prashad ko Peda - the round patties has a slight depression at the center and it is garnished with chopped pistachios. Image of a wooden Peda Press (molds) - they are hand-made by local carpenters and comes in a variety of shapes and sizes. The peda mixture dough is first shaped into cylinders, then sliced into several round circles. The molds are lightly greased and the circles are placed in the mold one by one. It is then gently pressed to form a creative and decorative shapes. The pressed peda should come out of the molds easily. 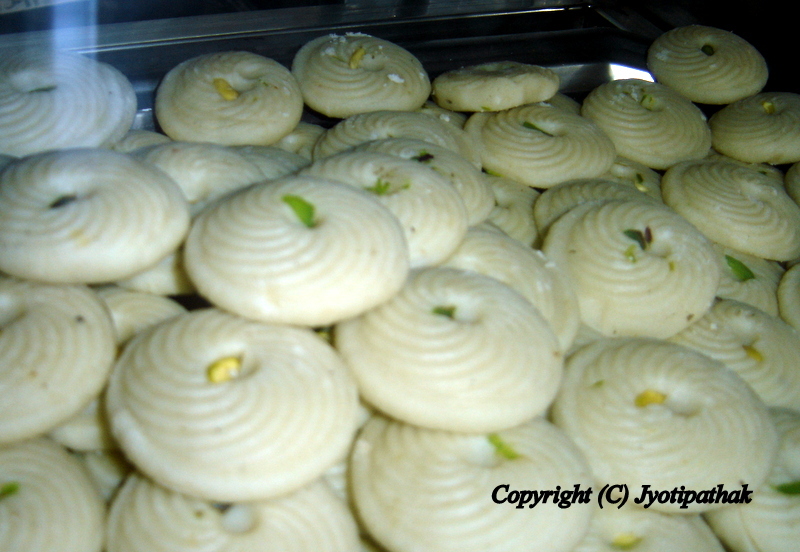 The elegant looking Doodh Peda - दूध को पेडा - (milk fudge) - freshly molded and ready to be enjoyed. A large selection of assorted Nepali sweets displayed at the local sweet shop - looks absolutely delicious! Ready for Jilfi or Jilphi? Here are the most delicious, crunchy-textured and pretzel- shaped sweets that Nepalese call it affectionally "Jilfi" and the more fancy ones "jerry". In India and Pakistan, they are called "Jalebi" and shares the similar ingredients. There is no celebration that is complete without this favorite sweet of Nepal. They are super simple to make - all you need is wheat flour, sugar and flavoring. The flour is made into a fermented sour dough batter. It is then squeezed through nozzle of a piping bag directly into the oil to form loops. The fried loops are dipped in warm cardamom-saffron infused sugar syrup, and drained. Don't say I did't warn you - jilfis are usually very sweet, but extremely refreshing and delicious. Nepalese usually pair it with a soft bread called swaari and serve for afternoon snacks. 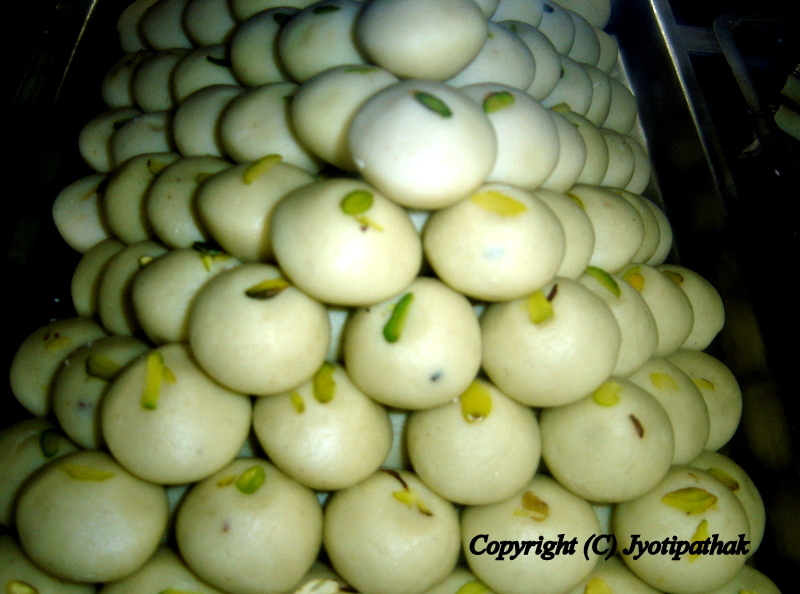 The combination of jilfi-swaari tones down the sweetness. It is also eaten at the breakfast time dipped in a warm milk. 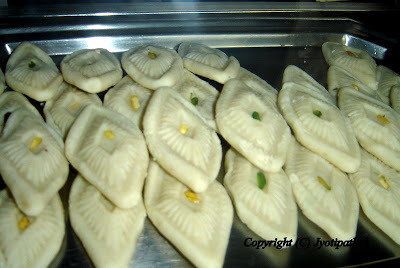 Jilfi is found in almost every sweet shops in Nepal. Look at the above picture of Jilphi with deep color and incredible flavor. This one came from Rameshwar's Sweet shop in one of the busiest marketplace of New Road (Kantipath) in Kathmandu. 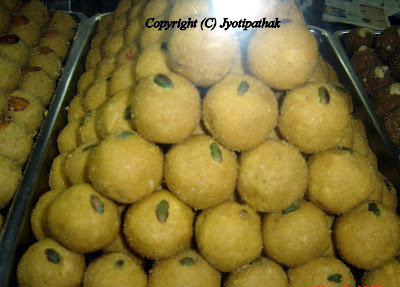 Laddus are traditional sweet balls that can be made from any type of flour such as chickpeas, wheat, semolina, or blend of these flour. Laddu comes from the Sanskrit word transliterated as ladduka or lattika meaning a small ball. It is a popular confection, eaten any time of the day with various beverages. The sweets are associated with religious offerings and used as a prashad food and most essential part of many celebrations, such as Dashain, Tihar, Bhai-Tika, Wedding ceremony (packed for sai-paata), and Mother's & Father's Day. They are golden yellow, granular and round festive treat made from chickpeas flour droplets and sugar syrup. To make this sweet, there are few steps involves. First, the chickpeas flour is made into a batter. Then, using a flat perforated spatula (jhanjar), the batter is dropped into hot oil to for tiny pearl-like droplets (boondi). These droplets are fried, then soaked in saffron-cardamom syrup, and rolled into round balls. The sweet is very time-consuming and requires considerable skill and experience, but the savory result is rewarding. Beautiful display of Assorted Nepali sweets at the local Haluawi Pasal (sweet shop) - a feast to your eyes! 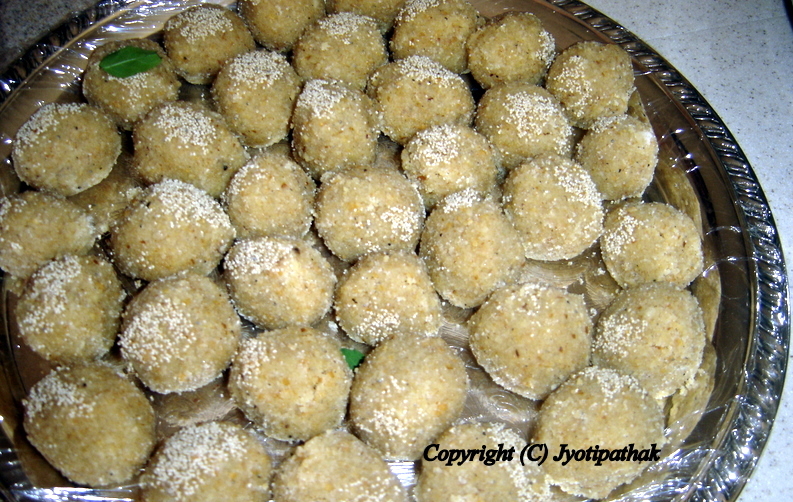 This sweet mouth-watering laddu is made out of semolina, sugar, pure clarified butter, green cardamom powder, chopped cashew nuts and grated coconuts. This is made from the skinless yellow moong daal, sugar, pure clarified butter (gheu), assorted nuts, and flavored with green cardamom powder and decorated with chopped pistachio nuts. Highly nutritious sweet made with a variety of variety of nuts and dry-fruits, with wheat flour, sugar and clarified butter. In this picture, a sweet maker is busy with a special order of Motichur ko Laddu for a religious function - working with a small handful of the chickpeas laddu mixture, he is rolling and squeezing between his palm to form 1-inch balls. 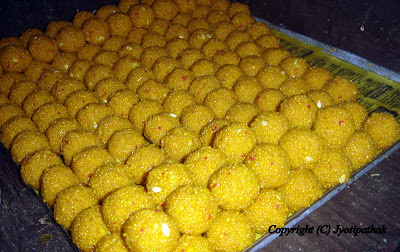 The Haluai Pasale (sweet maker) has carefully placed the sweet laddu on a tray, to harden for a few minutes. It is then transferred to an attractive platter and delivered to the religious function. Just a few ingredients and very easy to prepare. The basic coconut laddu includes grated coconut, butter, sugar, and flavored with cardamom, and some people add food coloring. Peda, a small, round patties prepared from thickened milk, is a popular Nepali sweet. Traditionally, they are made from Khuwaa, which is a slowly simmered-thickened milk. The color of the above peda is golden because of saffron has been added to it, making it a very festive sweet. This is one of most popular traditional Newari Mari sweets and is a variation of Laakha-Mari bread. They are flaky-crunchy textured delicious cookie-bread. The dough is hand rolled and made into beautiful design. They are deep-fried and glazed with a light icing to create translucent satiny finish. The above picture is the back view of Ainthe-Mari. Front side view of Ainthe-Mari - A reflection of perfection - In the narrow streets of downtown Kathmandu, Patan and Bhaktapur area, you will see many century-old local sweet shops filled with a variety of traditional sweets. The Haluwai pasale (sweet maker) and their staff busy stretching and designing the dough into perfectly beautiful sweet bread. I have taken so many pictures that I will have to make a separate blog post for this creative art of making Mari bread. 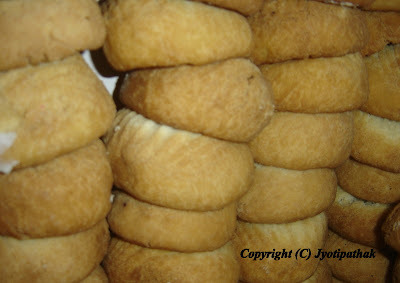 These are delicious buttery traditional cookies, that are very popular in Nepal. 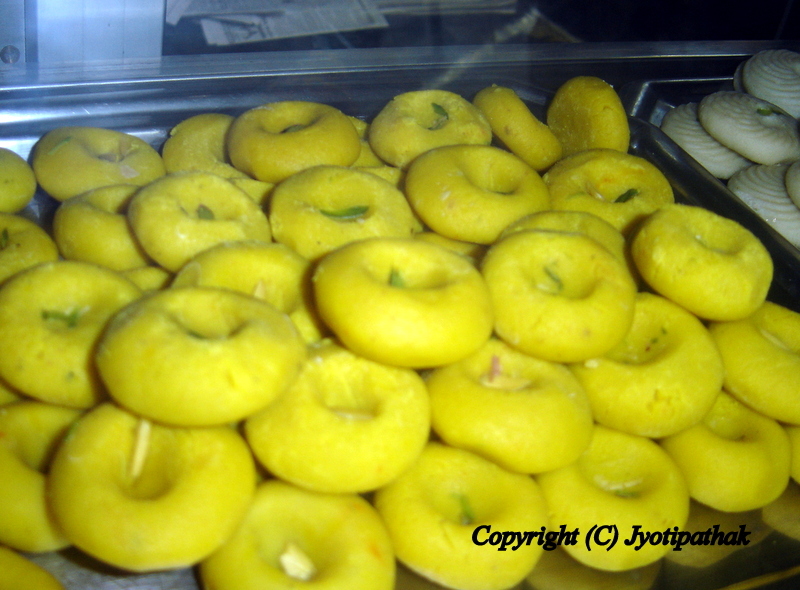 The khajuri dough is prepared with flour, sugar and clarified butter. The dough is rolled into a ball first, then shaped into small round, slightly curved patties (like a small bowl). The back side of the cookie is pressed into wooden khajuri press, creating a vertically lined design. It is then fried in the clarified butter until crisp. 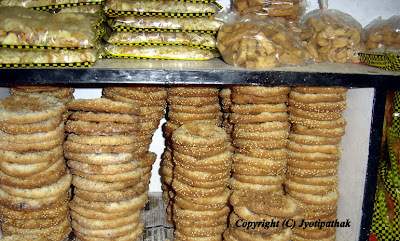 The impression made by the khajuri press remains in the cookies after it is fried. In the back of the above picture, a wooden khajuri press called "Thasaa"is displayed. 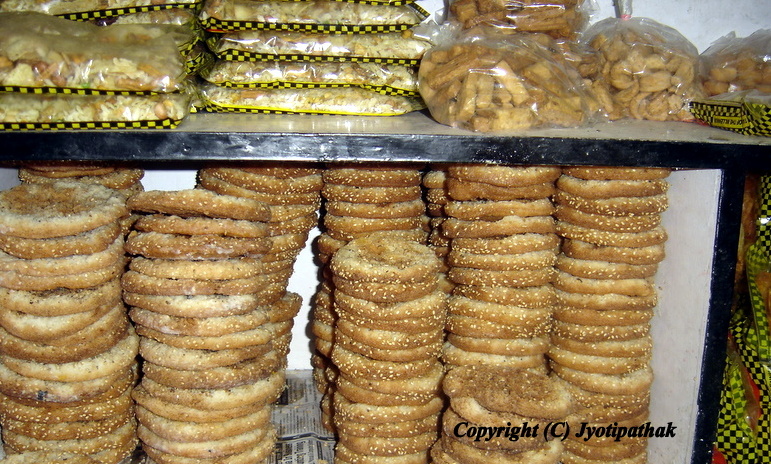 Khajuri - खजुरी - is a popular and favorite tea time sweet snacks of Kathmandu, cookies are displayed at a sweet shop. 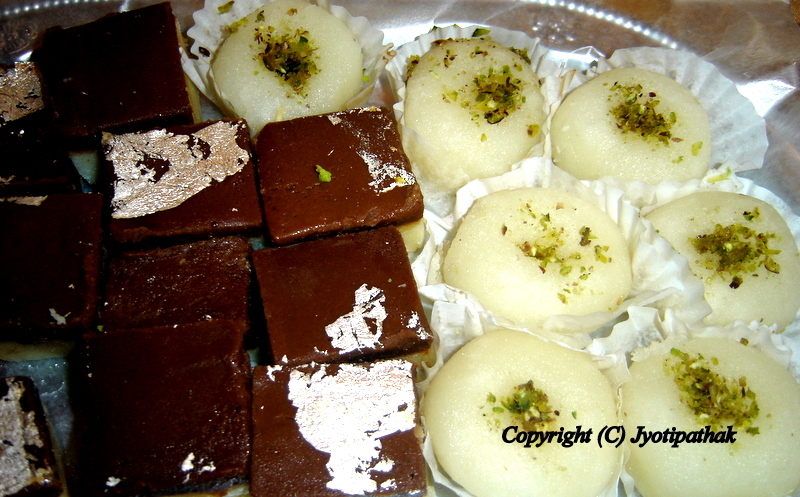 Savor the most traditional sweets of Nepal - From left (top) Khajuri, Flaky yellow Nimki, Chimti and Pabona Mari. Please turn to the next chapter (2 of 4) to take another virtual tour of the Traditional Sweets of Nepal. Thanks for such extensive information on Nepali sweets! Enjoyed the pictures, and the careful description of the sweets (makes it easier to explain to non-Nepalis). It's great that you actually met and talked with some sweet-makers as well. Thank you Sid R for your awesome comment, and appreciating my pages and pictures. Hope you will stop by again to check my new entries. We are friends with two Nepali students that are attending university here. I want to surprise them by making something to celebrate when they finish exams in two weeks. Is there a particular sweet or food you would recommend that I might be able to make for them with ingredients I should be able to find in the mid-West USA? Please check my cookbook "Taste of Nepal" for more Nepali dessert recipes. Thank you! I will try making Sikarni. And I will definitely be looking at your cookbook! I am glad that such a wonderful blog exists to represent different aspect of Nepal!!! congratulations. Thanks you Bijaya....Have a wonderful New Year! Amazing, I am glad i came across this blog. will visit often from now on. Thanks for sharing such a great recipe..Its really nice and informative. All the sweets are looking delicious. Thank you so much admin for this amazing article. Thanks a lot. And keep IT Up.